"If you build it, they will come." That was the sentiment Friday from billionaire philanthropist Jeffrey Gundlach, announcing another multi-million-dollar milestone for the $155 million AK360 expansion project. Officials gathered at the Elmwood Village landmark Friday to celebrate another $20 million raised. Gundlach is donating $10 million, an addition to his original gift three years ago, because a match challenge has been met. 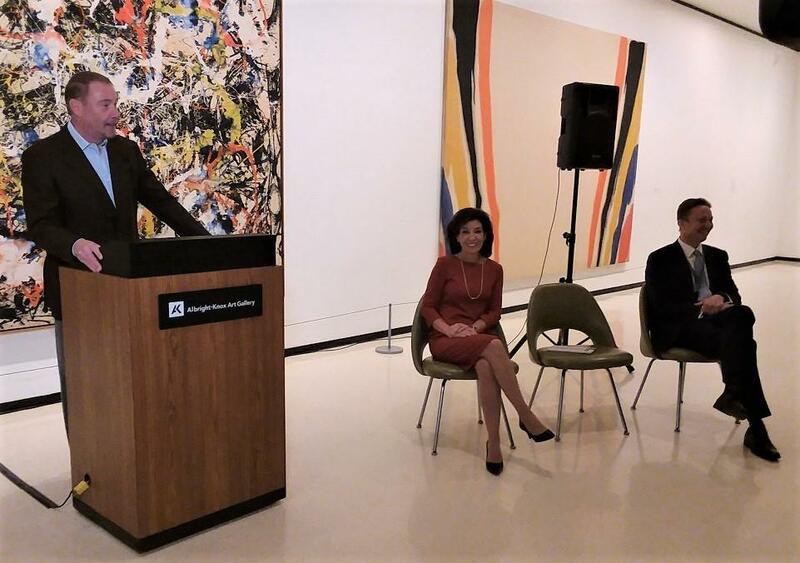 AK360 anchor donor Jeffrey Gundlach stands in front of a Jackson Pollock painting as he explains the matching grant challenge which has reaped an additional $20 million for the project. "His gift of $42.5 million made in 2016 brought our dream of an expanded, revitalized Albright-Knox into the realm of reality and unleashed a torrent from within and beyond Western New York," said Jann Siren, the museum's director. "Then, 13 months ago in November 2017, Jeffrey announced a second challenge. If we could raise an additional $10 million, he would match that too." Of the $10 million raised in the match challenge, $3.3 million is coming from New York State. Lieutenant Governor Kathy Hochul appeared to announce the state's latest contribution, which raises their total for the AK360 project to $18.3 million. "When I travel and go to places like the Whitney or the Metropolitan Museum of Art in New York City, they know all about us," Hochul said. "That gives me such a sense of pride in my heart. They know the work of Dr. Siren. They know the work of our incredible trustees and directors here. And they know that a place like Buffalo has been underappreciated for far too long." The expansion plan includes new buildings but underground parking that will reopen some of the park space on the museum grounds. One Gallery official suggested the hope was to break the first ground late in 2019. "I think it's gonna be great for the city and I think the investments from the county, city, state, Assembly, so on, will be paid off in spades, not just in economic revenue, but pride and reputation," Gundlach said. "So I'm thrilled to be the anchor of this project. We're going to see it through all the way home." When expansion is complete, expected in 2021, the center will be known as the Gundlach-Albright-Knox. Siren said the investments will reap benefits for generations. "We are building the Buffalo Albright-Knox-Gundlach Art Museum as a beacon of our shared excellence, as a torch that will guide this community and its citizens towards a bright and prosperous future," he said, "so that you can feel proud when people from around the world say, 'Wow.'" Gundlach said the gallery saw about 75,000 visitors annually when Siren became director in 2013, but he believes the new museum will bring in 500,000-600,000 visitors annually, numbers similar to after its 1962 expansion.